With sweaty palms, a stomach full of butterflies and trepidation knocking my knees together, I attempted my very first hive installation yesterday. I read and reread the process from three different books and trust me, it was more of a stall tactic than preparedness but when push came to shove, I was organized and ready, if not raring, to go. The evening before, the Artist and I drove a few concessions over from the old farmhouse at the appointed rendezvous time of 9pm, as assigned by the beekeeper's wife to bring our babies home. When we arrived we quickly realized their property was cloaked with more mosquitoes than bees so our conversations were brief and clipped with swats to the left, swats to the right, and swats up and all around. It may have looked like we were doing the Macarena. Quite possibly. When I asked him if I should install the hive when I got home, he stared at me with disbelief for about three seconds before shouting "No, no, they'll eat you alive!" So you can see why I was a little hesitant when it actually came time to do the deed. The photo above shows the basic hive, which right now is just the brood box, where the queen lays the eggs or brood, and resting on it is the nuc box, where the bees spent their first night at the old farmhouse. For the past two years I've pictured a cute white beehive sitting across the pond, but after some discussions at the beekeeping course, I attended, about paints, chemicals and future legal requirements for hives, I decided to go as natural as I could and put a few coats of linseed oil on all the outer surfaces, which was much easier and faster than painting, although it will likely require more upkeep. Once the smoker remained lit, which was a feat itself, it was time to open the nuc box. The bees started coming out in droves, and their constant buzzing was much louder than I expected but they weren't aggressive and I felt completely relaxed around them. Being covered from head to toe, may have had a little something to do with that. Or a lot. 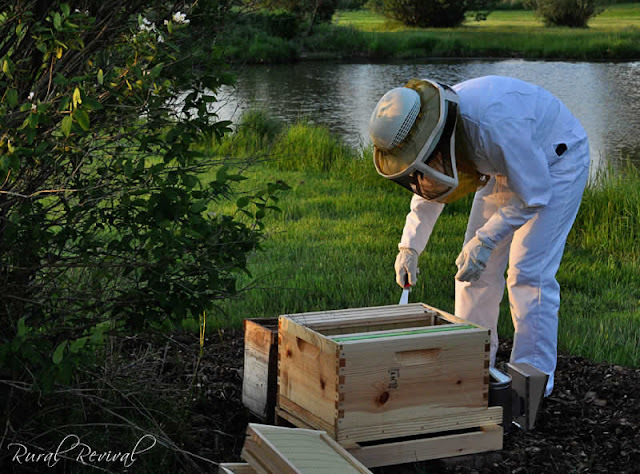 My main goal was to transfer them to the new hive as quickly as possible without squishing any of the bees. 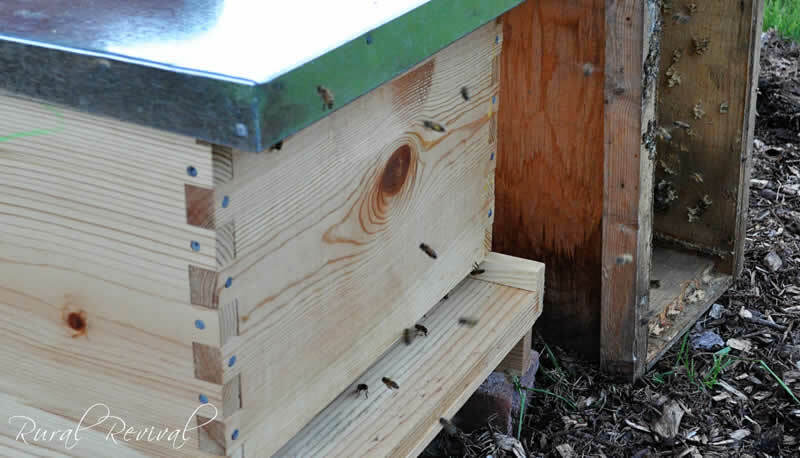 It's recommended that the frames remain in the same order in the hive as they were in the nuc box. I also wanted to check for the queen. I'm fairly certain that I found her on the second frame, but it's not easy finding her and my experience is more than limited leaving me to second guess myself. Time will quickly tell in the meantime my fingers are crossed tightly. 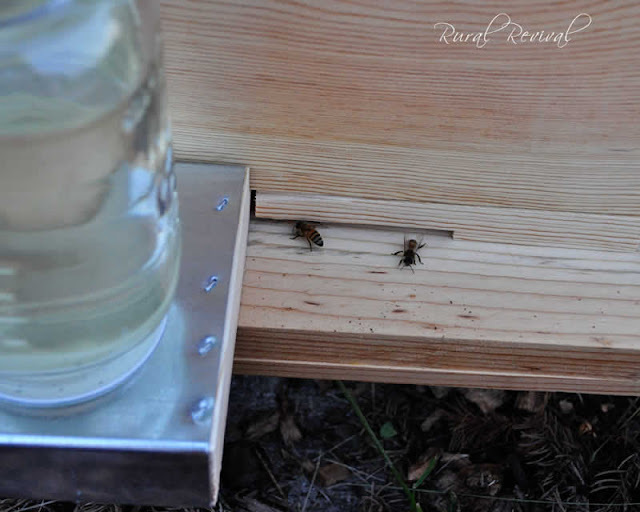 Once the the frames were nestled in the new home, I set up a jar feeder to provide the bees a sugar-water feed. 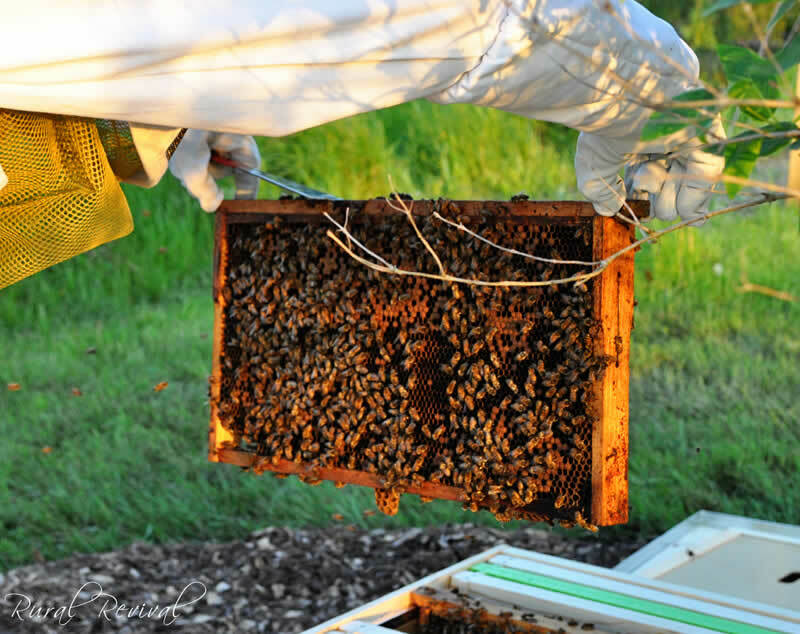 It's important that they have enough food to build up new comb on the new frames and there isn't always enough pollen to ensure they will have enough. Quite a few bees remained in the nuc box, much more than I expected. I hated to leave them outside the hive but most sources recommend just leaving the box nearby and the bees will eventually make their way over to their new home. Sure enough, by the next morning, all but one had made her way over. I ceremoniously delivered the last one on my bee brush, gently dropping her off on the landing board and watched as she quickly scurried into the hive. It was then that I considered how odd it seems that these wild animals are relying on me for their survival. After two days, they have depleted two thirds of the sugar water mixture and they're bringing in pollen. It's a treat to watch them coming and going, laden with pollen. The landing board today looked busier than Toronto airport and no air traffic controllers were needed! Here's to the revival of the honey bee and another Rural Revival at it's best. Andrea this is so cool! I've never seen anything quite like this and look forward to hearing more about your bees... and their honey. How interesting! I've seen some places that have many hives already installed, but I've never see the beginning stages. Can't wait to hear more about these guys. 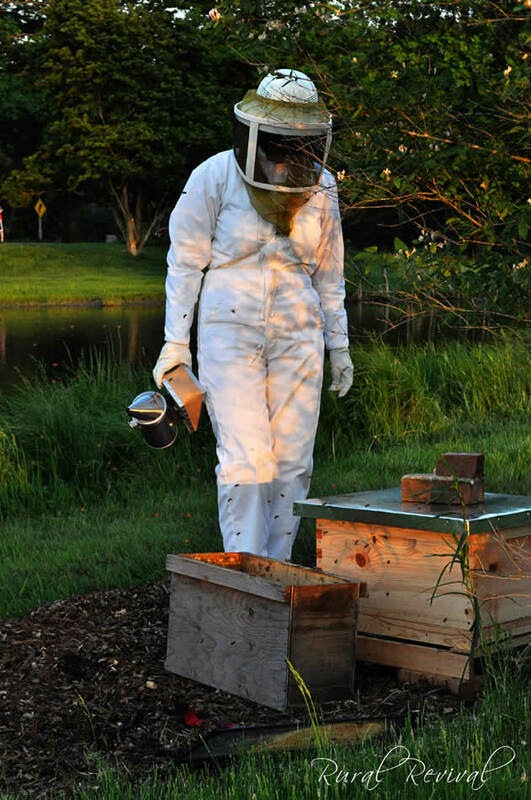 You looks so cute in your bee suit and so relaxed in the pictures...I think you're a natural bee keeper ;) Good luck and I'm looking forward to seeing pictures of your first jar of honey! Have a wonderful Friday. Wonderful, Andrea! I hope your bees fair better than mine. I'm sure I've lost them now to robbing. But since you have a nuc I'm sure it will be much better. Also, don't stop feeding them just because they're bringing in pollen - my grand mistake! Beautiful pictures! I want to keep bees someday because I love that home-grown honey, but I'm scared to death! NEAT!!! Congrats to you! I hope the prosper! Congratulations! I installed my first hive last month, and though I was also very nervous, I find that I am really enjoying working with the bees and it's very calming. I bet you will too. Good luck! This is awesome Andrea!! I am seeing more and more hives everywhere and that makes me so happy!! Can't wait to see your hive thrive!! You are so brave!! I want to get bees so bad, but my hubby and son are petrified of them. So for the time being it's a no go. I'm hoping when I retire I'll get bees since I'll have more time. It might also just be a stalling tactic..heh heh. This is so neat Andrea. I love reading about all you Bee folks. I look forward to more of your bee stories. 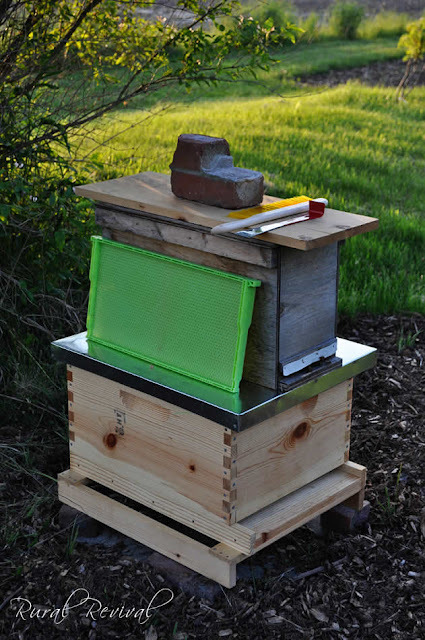 Starting a hive is something that hubby and I have seriously thought about. Up until this year we hadn't experienced the depleted bee visitations that we've been reading about. This year is different. So far our visiting numbers are much lower. Where we used to see the rhodies completely abuzz with bumbles, honey, and mason bees, now we see few of anything. I'll have to show hubby this post. Great pictures! I wish I could convince my family to try beekeeping, but so far they are not on board with that idea. This is great information. Although I doubt I'll ever have bees, at least I know how you do it. Good luck with this new endeavor! This is SO.AWESOME!!!!!! I'm so excited/proud/in awe of you!!! 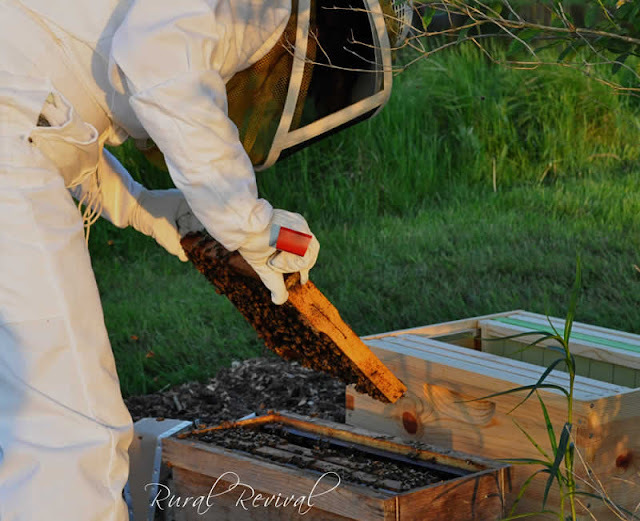 "Here's to the revival of the honey bee and another Rural Revival at it's best." Andrea, you are a very brave women! A wonderful post, bees are so fascinating, I look forward to future posts. BTW you look very professional in your bee suit! How exciting! I've always wanted bees. What an interesting read, Andrea. But I must tell you that although I have been fascinated with bees since elementary school lessons, and I realize their importance, the little critters make me very nervous. Not creeped out like wasps, but nervous. It is lovely to see more of them this year than in past years too. You are a good steward and I applaud your bravery. I've been wanting to have a bee hive for quite some time now, but am so terribly intimidated. Maybe I'll look into it as the bees sure need our help. I hope your new little friends remain healthy and productive. Do you have plans for their honey, or are you just letting them keep it? I am so very proud of you! Yay! You did it! I can's wait to see more pics and read more words!